Following the unfortunate outcome of a recent election, the Province of Alberta is now governed by a mob which seems to be intent on the destruction of Western Civilisation in general and Alberta economic well-being in particular. Warm monger Rachel Notley is the new Premier, and she appears to have assembled a team of Ministers and other cheerleaders drawn directly from the ranks of the Arts and Fine Arts community in academe. It is apparent that to them logic, reason, evidence, and prudence are foreign notions at best, and at worst ideas that never entered their minds. Unfortunately they all relate to the Marxist drama teacher queen who is now the Canadian Prime Minster. This is my submission to that request. This submission discusses the proposition that a phenomenon called “Catastrophic Anthropogenic Global Warming” known as CAGW is fantasy rather than reality. The discussion takes place in reverse order of the acronym. Like Voltaire, I prefer to define the terms before engaging in discussion. It can be pointless if the subject is defined differently by those discussing it. Meriam-Webster defines “Global Warming” as “an increase in the earth’s atmospheric and oceanic temperatures widely predicted to occur due to an increase in the greenhouse effect resulting especially from pollution”. That such an increase in temperature is reality. In fact, the science of geology demonstrates that Earth’s atmospheric and ocean temperatures have been in a declining trend since the Holcene Optimum, approximately 8,000 years ago. This trend has excursions up and down relative to a strictly linear relationship, but bears a century on century variation of less than two percent. That a mechanism called the “greenhouse effect” is real. Since a greenhouse creates an artificial environment by limiting heat transfer via convection since it is an enclosure. Earth has no such enclosure. The concept that the atmosphere “traps” solar radiation is nonsense. The difference in the temperature at the surface relative to the value that temperature might be in the absence of an atmosphere is simply the adiabatic lapse rate, as is the case with any celestial body with an atmosphere. While it is true that CO2 absorbs infrared energy (IR) and re-emits, its effect is insignificant relative to natural processes. CO2 is limited to 15 +/- 1 micron wavelengths, whereas water vapour spans the range from 0 to 50 microns. The abundance of water vapour in the atmosphere, in addition to the physical attributes of water in all its phases regulates the rate at which energy is released back into the void. This is in no way anomalous to a “greenhouse”. Conclusion: By definition “Global Warming” is illogical nonsense. I refer to the definitions used by the IPCC. There are two. Let us first consider the first. This clearly refers to “the climate” which is nonsense in the same way that “the science” is nonsense. It suggests that “the climate” is in reference to the entire planet. Climate, by definition, is REGIONAL. The climate of a particular geographical location is described in systems including Koppen-Geiger, Holdridge, or Trewartha. In determination of the appropriate classification, many parameters are involved. It is impossible to determine some average of all of the regions of the planet in order to determine “the climate”. Only a classification system can attempt to measure a region’s climate. In order to determine whether or not there is a change, it is necessary to be able to measure it. Since there is no way to determine what “the climate” is, or in fact to measure it, the term “climate change” is meaningless nonsense. While human activity may well alter a regional climate through land use, there is nothing to suggest that human activity has any impact on the climate of a region by altering the composition of the “global atmosphere”. Again, this is not measurable, since the “global atmosphere” is not homogeneous, and the term is nonsense for the same reason that the term “global average temperature” in nonsense. Both terms are mathematically and thermodynamically impossible. Certainly, the climate of some regions changes classification completely (but that is pretty rare). The size and shape of a particular classification’s region may change over time. Certainly, the greening of the planet over recent decades creates changes when the discussion alludes to the Trewartha classification. Conclusion: The term “climate change’, in the current common vernacular, is nothing but jibber jabber. There is a third definition of “climate change”. It is a euphemistic identity for “global warming” obfuscating any provocative mention of “warming”. It’s ironic that the only manifestation of (definable) “climate change” to have emerged yet is “the greening”. The distribution of CO2 is discernible from NASA’s OCO2 satellite. It confirms that the distribution of CO2 in the atmosphere is far from homogeneous, making the measurement at one position in the central Pacific ludicrous. The satellite OCO2 clearly shows that CO2 is most abundant not in the industrial areas of the Northern Hemisphere, but in the rainforests and huge river systems of the Southern Hemisphere. That the greening of the planet that has occurred simultaneously with a 25% increase in CO2 is also obvious from satellites. In order for human activities to influence the temperature of Earth’s surface, a mechanism would be necessary which dwarfs the effects of nature. The scientific method requires that any hypothetical proposition, such as that of AGW, must first consider the “null hypothesis” that any observed changes are nothing but result of natural processes. Contrary to popular opinion, the process we call “science” never proves ideas; but rather disproves them. The first step in the method is to disprove the null hypothesis. In over three decades of discussion, this step has never been accomplished. Conclusion: Human activity cannot influence the surface temperature of the planet since it is insignificant relative to the natural influence of the sun and natural celestial phenomena. Figure 1 displays the cyclical nature of the slight temperature variations in the geological record. Note that there is a tendency for temperature to peak at thousand year intervals. These correspond to such periods as the Egyptian Old Kingdom, the Minoan, the Roman, the Medieval, and the late twentieth century. These are periods during which the species Homo Sapiens has enjoyed a favourable environment. There is nothing to suggest that warmer temperatures incur hardship. In fact, the opposite is true. It is the cold temperatures of the periods following the peaks that have resulted in human misery. 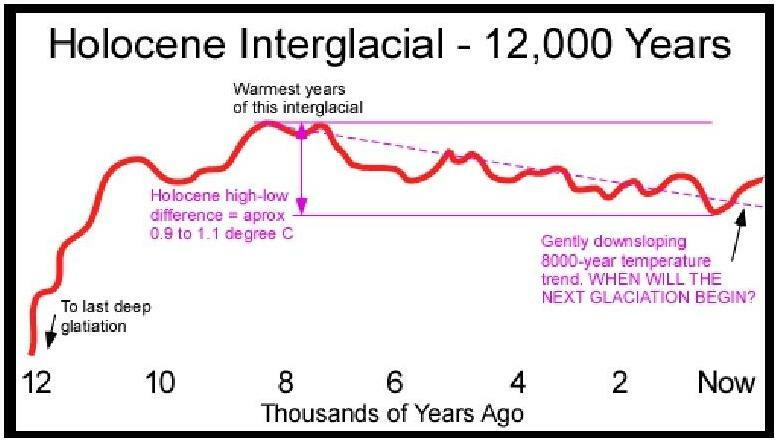 Conclusion: It is a plunge in the temperatures of the current interglacial that would be catastrophic for the human race; not an increase in such temperature. In November 2009 over 1,000 emails leaked from the Climatic Research Unit (CRU) at East Anglia. No rational human being, on examining these emails, would be unable to see the massive public deception. The perpetrators of this sophistry apparently think deceiving the public is “fun”, as illustrated in this email from Geoff Jenkins of the UK Met Office to Phil Jones, Director of the CRU. Environmentalism, in the form of Climate Change Alarmism, is a religion. ► Rituals ==> Erecting wind farms, ‘burning’ deniers, ‘stoning’ apostates. ► Demons ==> Sceptics, in the pay of Big Oil, vital to cast them out. ► Evil Spirit ==> Greenhouse Gas – it cannot be seen nor touched, but its effects can be felt, even physically. Perhaps, like Islam, it is more accurately identified as an evil ideology rather than a religion. Both of these pseudo “religions” take lethal aim at the very core of our civilisation. There is no empirical evidence that CO2 and other trace gases affect the temperature of Earth’s surface one iota. The “evidence” that the charlatans put forward are is the output of computer models. It is an old adage now that in the world of information technology “garbage in, garbage out”. 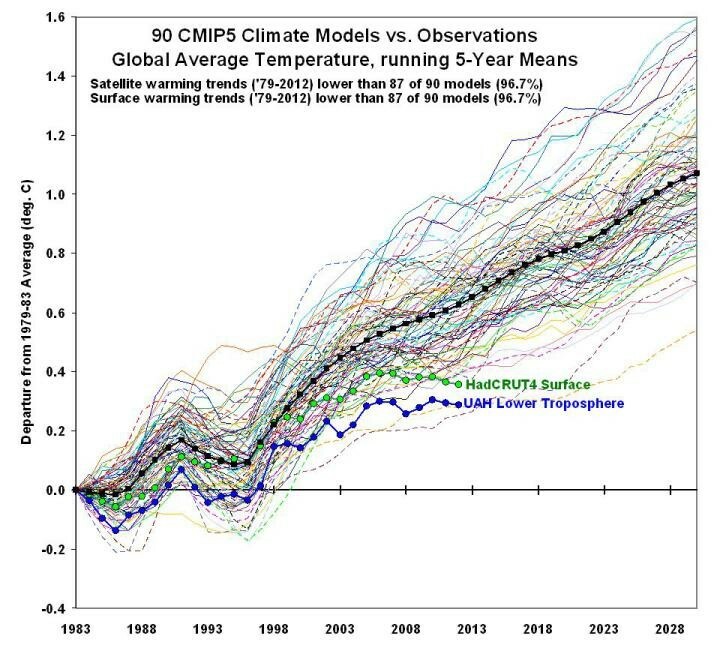 In order for the general circulation models (GCM) to be so horribly inaccurate, any fool with half an eye can see that the basic algorithms are sheer nonsense. This is illustrated in figure 2. Taxpayer funds in the order of four billion dollars a day world-wide are wasted on the “climate scam”. As a result, energy poverty is a real problem in the Third World, and in fact has become a problem in the West. Unreliable expensive windmills and solar panels only serve to line the pockets of the swindlers. Nearly half of the populations in the West realise that “climate change” is nothing but an attack on individual liberty. The ratio of non-believers in the climatology religion to believers is increasing rapidly, as recent surveys in the USA and Australia indicate. When this ratio exceeds fifty percent, a real “tipping point” will be reached. The result will not be pretty for the scammers. The CAGW scam is the most expensive hoax perpetrated on the people of the world since the beginning of time. Resources the world over, to the tune of several billion dollars go up in smoke every day expended on pseudo science, fake science, faulty research, useless government programmes, scams, rorts, and expenditures in useless so-called “renewable” energy. ‘Don’t you see that the whole aim of Newspeak is to narrow the range of thought? In the end we shall make thoughtcrime literally impossible because there will be no words in which to express it’. ‘There is a word in Newspeak’ said Syme, ‘DUCKSPEAK; to quack like a duck. It has two contradictory meanings. Applied to an opponent, it is abuse, applied to someone you agree with, it is praise.